Sized for use as a Go-Bag, day trips, office commutes, or as a smaller carry-on, the RUSH 12 pack is loaded with most of the same features as its larger teammates for maximum utility. Designed by special operations veteran, Kyle Lamb of VTACTM, the RUSH 12 was created because of end-user input. Its large main compartment has a pocket that will fit most sleeved laptops and the bungeed cinch top will keep any load in place. Two mesh pockets on the inside of the main flap hold computer accessories, electronics, binos, and other smaller items you want readily accessible. The Admin compartment on the front of the pack opens wide and has slots and pockets to organize pens, business cards, camera, GPS, and much more, plus two key keepers and a large internal zippered pocket. 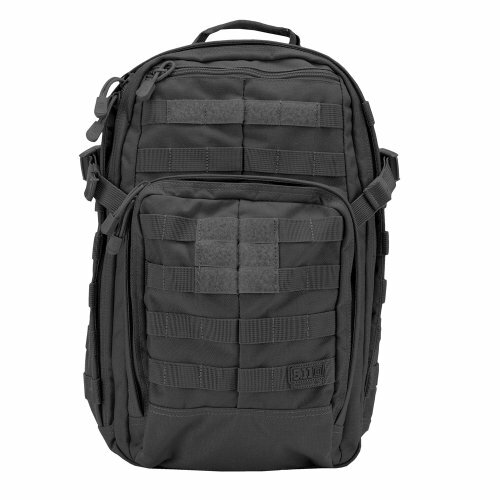 Web platform on the outside of the compartment allows you to add pouches or patches for even more gear capacity. The 5″H x 8″W zippered pocket above the Admin compartment is a handy spot for radio, phone, travel documents, energy bars, and smaller gear. There is also a zippered fleece-lined eyewear pocket on top, just behind the heavy-duty grab handle. Dual concealed hydration tube ports are located to the sides of the handle. Both sides feature top-to-bottom web platform, allowing you to attach a host of different accessories. The back panel conceals a reinforced hydration pocket that will accommodate bladders up to 60 oz. The extra padding on the back panel promotes ventilation and the anti-skid pads help keep the RUSH 12 in place. There are tri-glide fasteners at the bottom corners in case you want to add a waist belt. The padded contoured shoulder straps have four rows of web platform and the sternum strap can be adjusted to four heights. Excess webbing can be gathered at the bottom of the straps with the elastic keepers.